How many times have you had your Mac die on you when you were just about to finish an ultra-important task? This week we have a long-anticipated addition to Setapp family in the form of Endurance app. Behind a tiny eternity icon hides a powerful app that helps your computer live hours longer when you really need it. Endurance by Magnetism Studios is a battery saver for Mac that is truly irreplaceable for remote workers and travelers. Let’s take a closer look at what Endurance is about. It’s a simple app that doesn’t have a Dock icon, merely a menu bar preference list. It’s installed in seconds and doesn’t take up much energy or space, running in the back of your everyday tasks until it’s time to shine. That’s pretty basic and still super efficient. Keeping the dim-lit screen can reduce your battery drain massively and win you time to finish stuff. Now, that might sound like Endurance is checking price lists on the Mac App Store but expensive here means energy-hungry. For instance, Chrome browser is a real monster when it comes to RAM consumption and it heavily contributes to draining your battery. 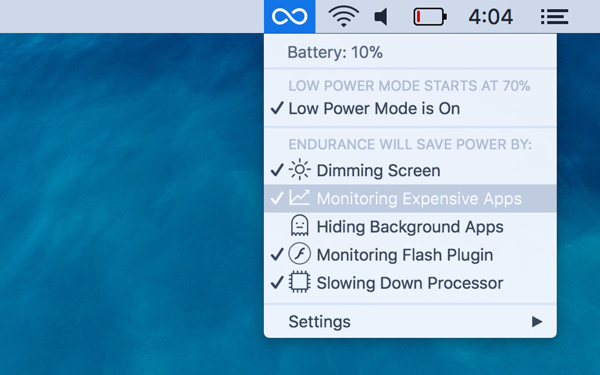 You can normally view “expensive apps” in Activity Monitor or better using iStat Menus but that doesn’t give you control over these apps. Endurance, on the other hand, is able to find and eliminate battery-draining apps by putting them to sleep when you don’t need them. So instead of checking iStat and looking for power-eaters on your own, you can have it all done for you. This feature also puts apps to sleep but instead of focusing on the heavy ones, it kinda takes out everything that you’re not looking at right now. Simply put, all the background apps. When you run your usual amount of helluva tasks at once, your processor can get a little carried away with power consumption and reach into overdrive. There is really no reason for it to work that hard all the time, especially when you’re at a risk of a dead battery. What Endurance app does, in this case, is slow down the heat if task processing, which may result in a negligible decrease in speed of work but give you extra time. Pros vs cons are pretty clear in this case. The best part about Endurance is that all of the above can be both absolutely automatic and entirely customizable. You don’t want your screen dimmed? Uncheck it in the app’s menu and your screen will not darken in the Low Power Mode. Same goes for all the tools on the list but remember: the fewer Endurance tools you leave active during the Low Power Mode the less impact it will have on the battery life. If you favor intelligent software, you’ll be glad to know that the question you see in the screenshot is skippable. You can set Endurance to run its tools fully independently, never asking you for permission and thus not adding to distractions. 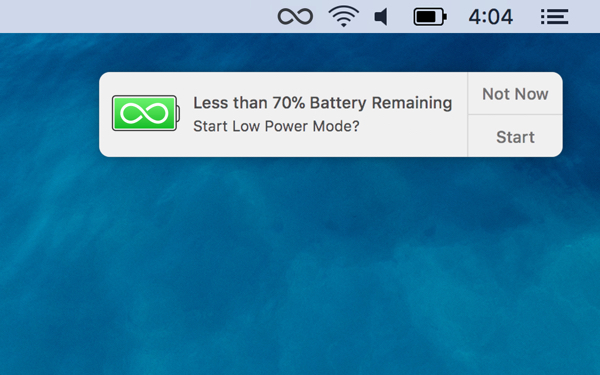 It will simply take care of your Mac’s energy consumption and battery life every time you reach the charge percent you set. Endurance is available on Setapp from today and everyone with active Setapp subscription can enjoy it’s wonderful benefits of long hours of Mac’s work. That’s about it with the walkthrough, have a good day, cheers!